People travel from all over Europe to enjoy the roads of central Scotland, but I’m just lucky to live here and have it all on my doorstep. So rather than ride long distances on an adventure bike or big tourer to get here, I only have to walk into the garage, start up my Hyosung 650 and head off for a few hours’ fun. This figure of eight circuit is 260 miles and should take about five hours plus stops. 260-mile day ride and the prospect of Green Welly breakfast – no wonder he’s smiling. I’ll start at the Kirkhouse Inn in Strathblane, a few miles from home on the A81 out of Glasgow. It’s a main road, but takes a pleasant meander into the Loch Lomond National Park, and on to Aberfoyle – it marks the start of the Duke’s Pass, a road originally built by the Duke of Montrose in the 19th century to improve access to his estate, and later upgraded to cater for Victorian tourists. This town is a popular tourist stop with a Woollen Mill Outlet, sheepdog demonstrations and various shops and cafés. 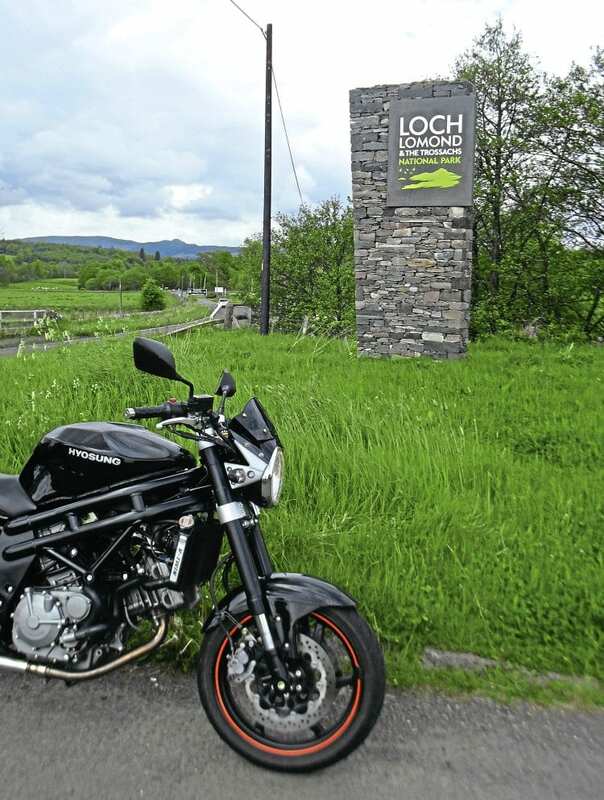 It’s also a favourite destination for Glasgow bikers wanting a short blast into the countryside, so there are often plenty ready to chat. 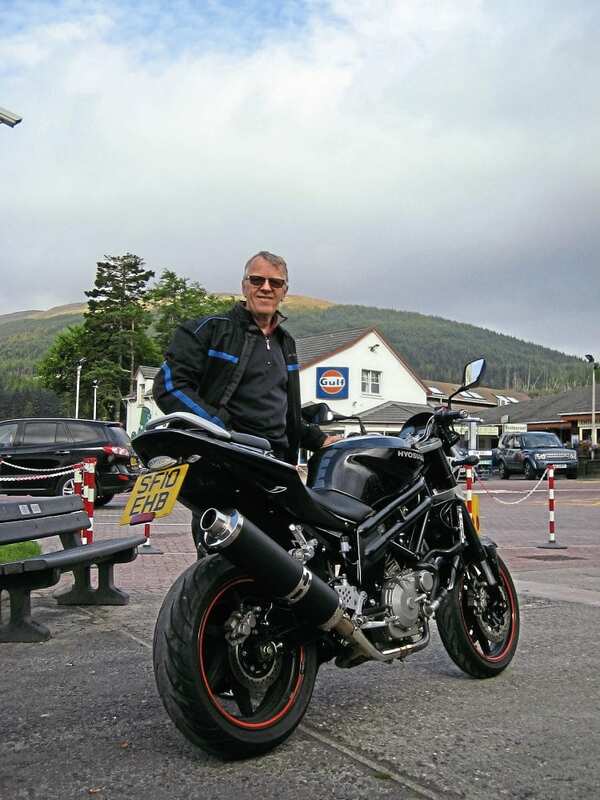 Alex’s day ride takes you through the heart of the Trossachs. The Duke’s Pass is now the famously twisty A821, which we follow for seven miles until meeting the A84. Turn left for Crianlarich, and the road becomes the A85 as you travel north past Lochearnhead. Further along you can make a detour to visit Killin and the beautiful Falls of Dochart, on the left as you ride into the village. Continuing through Kiffin would offer a great ride north to Pitlochry, but that’s for another day, so turn back towards the A85. At Crianlarich, turn right onto the A82 for the Green Welly Stop in Tyndrum, on an increasingly twisty section of this fastish A-road. The Green Welly is always busy with bikes, both tourists and day-trippers, and is sometimes used as a location for displays and demo rides by bike dealers. An ideal place to stop then, for fuel, sausages and chat. Duke’s Pass was built by a real Duke – much obliged, yer honour. 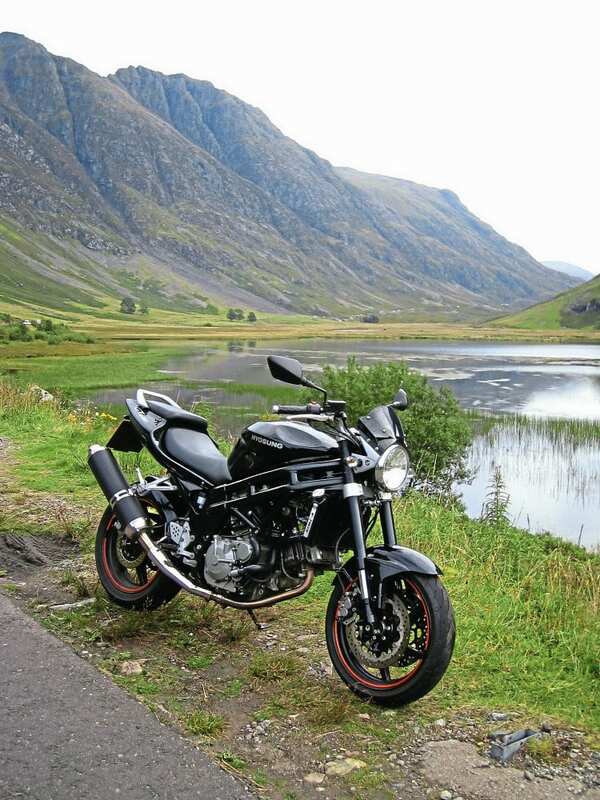 Head north out of Tyndrum and just outside the town bear right to stay on the picturesque A82, riding up across the lower edges of Rannoch Moor and into Glencoe. This area has so many stories, the most infamous being the Massacre in 1692, when families of the Clan MacDonald were attacked and murdered in their homes by their long-term adversaries the Campbells. It happened because Clan MacDonald did not swear allegiance to William III within the permitted time, apparently due to a mix-up over where they should take the oath, and the government-backed Campbell forces were instructed to exterminate the clan by killing every MacDonald under 70 years old. Glencoe village at the west end of the glen is located close to where the massacre took place and the nearby visitor centre provides more detail of the area’s bloody history. Glencoe – proof that bloody deeds and beautiful scenery can share the same spot. When you come out of the glen and reach Ballachulish you may be tempted by another option to head further north, towards Fort William and the famous routes around Applecross and the west coast, but again, that’s a long loop for another day. This time we take the A828 coast road down Loch Linnhe, heading south towards Connel, where we cross the bridge and take a left onto the A85 to head back towards Tyndrum. If you fancy a seafood stop, detour a few miles south to the lovely fishing town of Oban and fresh seafood on the harbourside. Falls of Dochart at Killin are worth a picture stop. The A85 back to Tyndrum winds through the Pass of Brander, with the road cantilevered over the River Awe as it meets Loch Awe, an amazing piece of engineering. 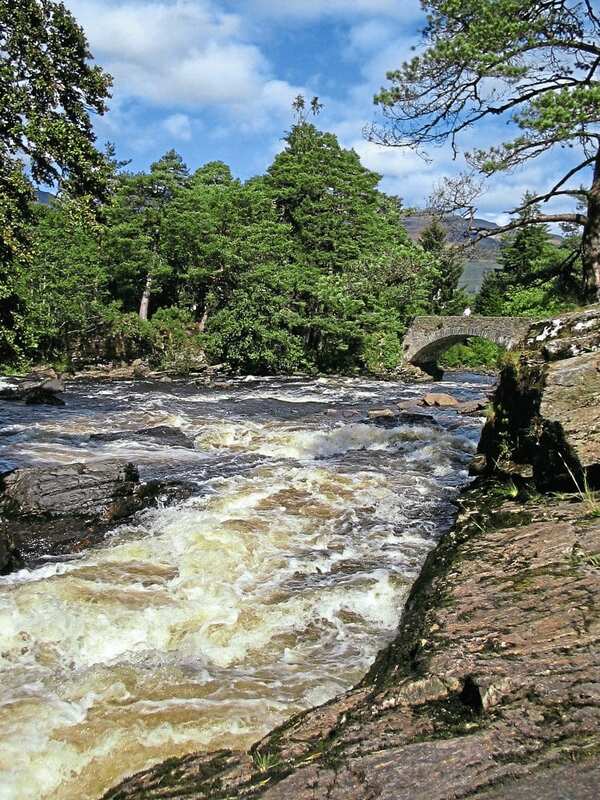 If civil engineering is your thing, there’s a hydro-electric scheme at Cruachan. Given the more romantic name Hollow Mountain, it’s a power station buried half a mile underground, inside Ben Cruachan. It’s not new – construction started in the late 1950s – but you can still tour the whole thing by bus, and there’s a visitor centre that tells you all about it. After Tyndrum it’s time to head home by taking the A82 back to Crianlarich, following the road for Loch Lomond and Glasgow, but you don’t need to go back the same way. If you feel like another stop, turn into Balloch at the south end of Loch Lomond, which is a real tourist honeypot. 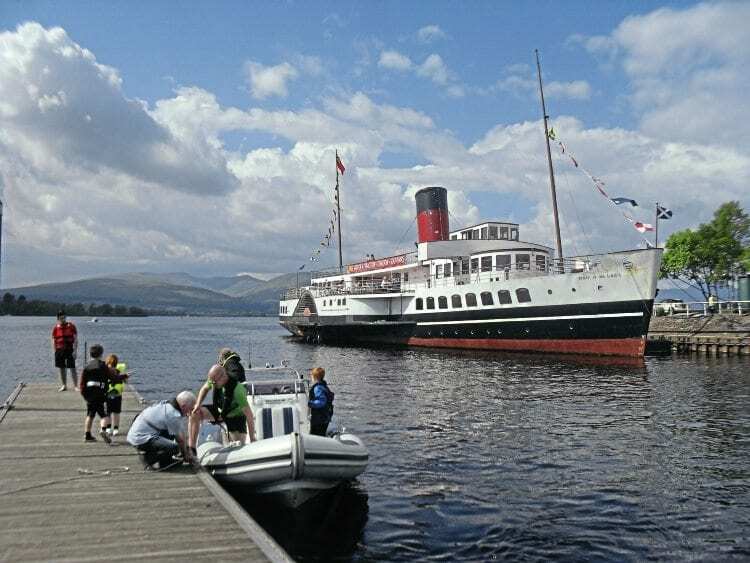 The Maid of the Loch paddle steamer is being restored here and is worth a look. Maid of the Loch paddle steamer is being restored. From Balloch there’s a choice of routes back to Glasgow. Most direct is the dual-carriageway through Dumbarton, but to complete this figure of eight day ride circuit, we take the A811 Gartocharn Road towards Drymen, then join the A809, turning towards Glasgow before cutting back over the B834 to the A81. 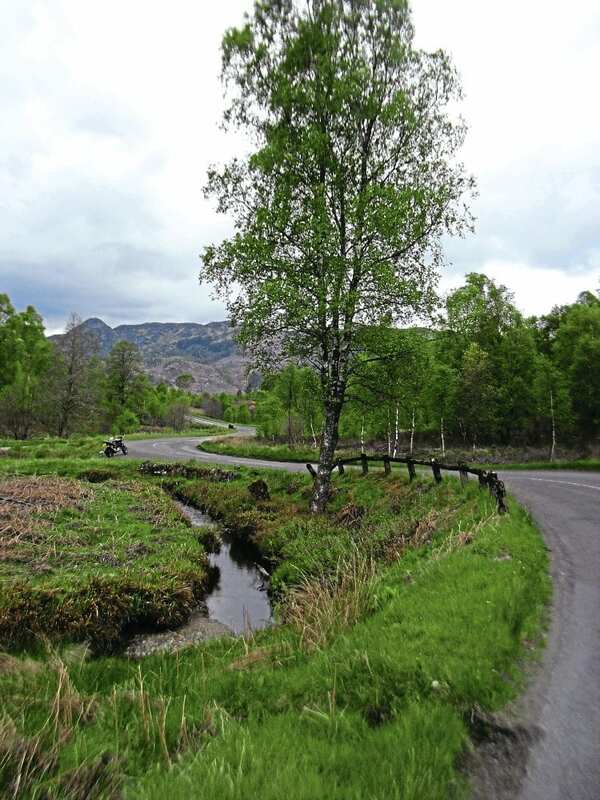 This road returns past the Glengoyne Distillery and brings you back to the starting point in Strathblane. 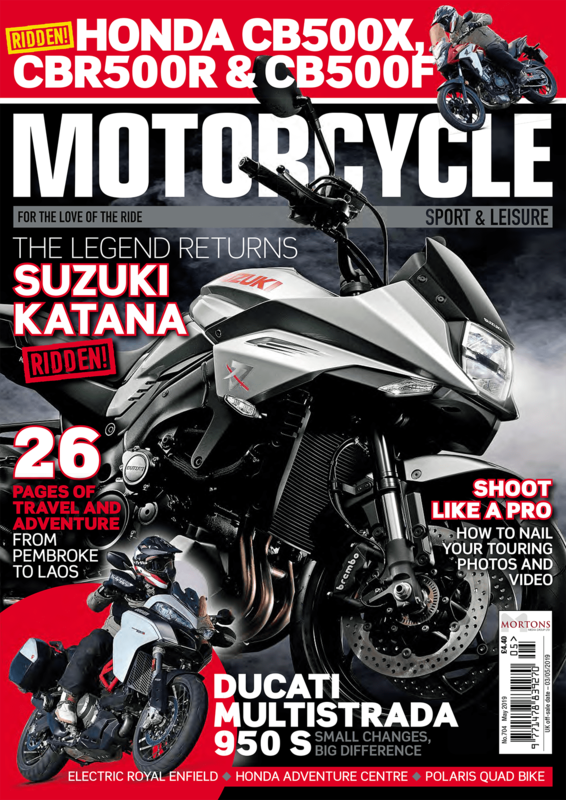 Next Post:MSL April 2018 out now!